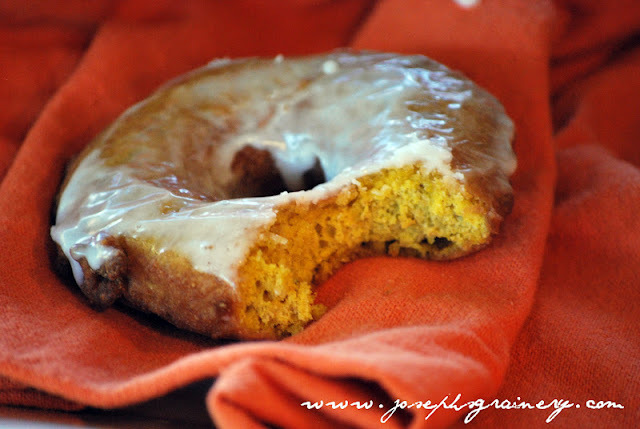 What's more fun to eat on a Saturday morning in October than Glazed Pumpkin Doughnuts made with whole grain flours from Joseph's Grainery? I was a little impatient for MaMa to finish making the donuts so I could get my breakfast (in fact DaDa had to help get me a bowl of cereal, as I just couldn't wait any longer...it's hard being two), but they were sooooooo worth the wait. A fun way to start a Fall day! Whisk together the dry ingredients. Cream together the sugar and butter in large bowl. Beat in egg, then yolks and vanilla. Gradually beat in buttermilk; beat in pumpkin. Using rubber spatula, fold in dry ingredients in 4 additions, blending gently after each addition. 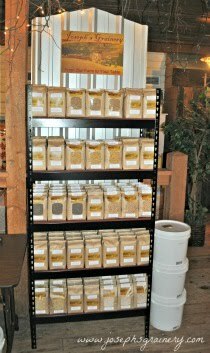 Press out 1/3 of dough on floured surface to 1/2- to 2/3-inch thickness. 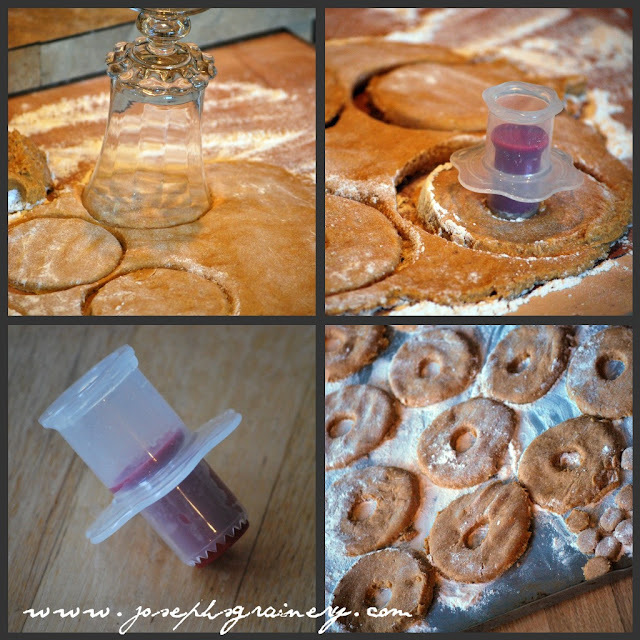 Cut out dough rounds, using whatever you may have that'll get the job done (we used a glass). Arrange on sheets. Repeat with remaining dough in 2 more batches. Gather dough scraps. Press out dough and cut out more dough rounds until all dough is used. Using 1-inch diameter round cutter ( we used a cupcake corer, cause that's what we have) cut out center of each dough round to make doughnuts and doughnut holes. Pour oil into large deep skillet to depth of 1 1/2 inches. Attach deep-fry thermometer and heat oil to 365°F to 370°F. Fry donut holes until golden brown, turning occasionally, about 2 minutes. Using slotted spoon, transfer to paper towels to drain. Fry doughnuts, 3 or 4 at a time, until golden brown, adjusting heat to maintain temperature, about 1 minute per side. Using slotted spoon, transfer doughnuts to paper towels to drain. Cool completely. Whisk powdered sugar and milk together to form medium thick glaze. 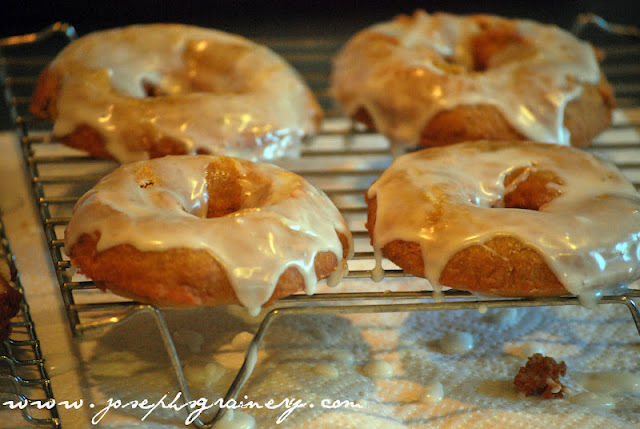 Spread donuts on 1 side with powdered sugar glaze. Set donuts on racks to let the glaze harden. Is your mouth watering yet? MaMa let me have the first bite! I wished I hadn't had that bowl of cereal, so I would've had more room for more donuts!